There are plenty of ecommerce frameworks available, but there is a reason we specifically choose to work only with Shopify. We know that your ecommerce store is a vital part of your business and you need something that is reliable, secure, and gives you easy control over your products. A good store can give your customers the confidence to part with their money, purchase your goods and grow your online sales giving you a higher ROI. 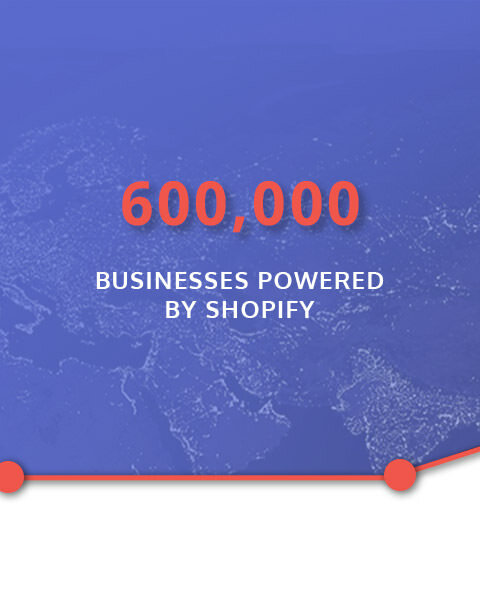 The Shopify platform can help provide everything you want from an online store and is trusted by over 500,000 successful stores with customers having sold over $55bn+ through their Shopify stores. So why Shopify? Well its simple. We truly believe they are the best ecommerce framework in the world, and your store deserves the best. Your Shopify store gets a free 256-bit SSL certificate (the same level used by banks) across your whole website, giving your customers the upmost confidence in your stores security. Shopify supports over 100 payment gateways. As well as accepting all major debit and credit cards, you can also accept payments from PayPal, ApplePay, Amazon Payments and Bitcoin. All of our Shopify stores are optimised for search engines to make sure your customers can find you. Shopify gives you the ability to control key SEO criteria across all pages on your shop. You can manage all your shops inventory in one place and track every sale. Shopify will stop out of stock products being sold so you never oversell to customers. Your online shop comes with unlimited bandwidth so you can be sure no matter how much traffic your store gets it will always be up. This is a set of security standards designed to ensure credit card information is maintained in a secure environment. Shopify meets these standards so you can be assured your customers details are secure. Never lose a potential sale with automatic emails to customers who have abandoned there cart, prompting them to come back and complete there purchase. All Shopify stores come with the ability to have unlimited products so no matter how much your store grows you wont run out of room online. Shopify’s team work 24/7 to make sure stores are always up so you done need to worry about the IT side of your online shop. All customers get free 27/7 support via online chat, email and phone so you can have the confidence that there is always someone to support you at any time.